↑ "UFC Fighter Rankings". UFC. Retrieved December 11, 2015. ↑ "Women's Bantamweight (129-139.9 lbs) fighter ranks" (Official Release: #462). December 10, 2015. Fight Matrix. ↑ Manfred, Tony; Davis, Scott; Gaines, Cork (मे ६, २०१५), "The 50 Most Dominant Athletes Alive", Business Insider, "She's not just undefeated, she's effectively untouched"
↑ Martin, Damon (September 16, 2015). "Ronda Rousey says she’s highest paid fighter in UFC during Ellen Show appearance". Fox Sports. ↑ "Ronda Rousey". Sportsclash. Retrieved January 11, 2016. ↑ Alexander, Jim (July 24, 2015). 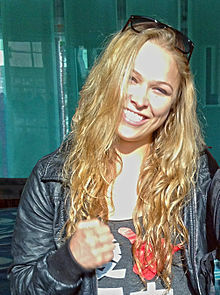 "ALEXANDER: Rousey's stardom goes way beyond UFC boundaries". en:The Press Enterprise. ↑ Martin, Brian (July 29, 2015). "Ronda Rousey: Pro fight No. 3 - defeated Sarah D'Alelio via technical submission (armbar), 0:25, first round". Los Angeles Daily News.